Who couldn't stand to save some money? If you're penny pinching but still want something fun to do, check out these fun, free things to do in Little Rock. Arkansas has lots of great little spots that won't cost you anything, except maybe a tank of gas. The Historic Arkansas Museum, 200 E. Third St., lets you experience living history. The museum features five restored early 19th-century homes, including Little Rock's oldest remaining building, the Hinderliter Grog Shop (1827). The best part is the actors who portray some of Arkansas' earliest residents and give you a taste of frontier life. Tours are free the first Sunday of each month. Check their website or call for hours and more info. Browse through the Arkansas Arts Center. You'll see displays of local, regional and national artists with permanent exhibits and traveling exhibits. Located near MacArthur Park. Always free but donations are accepted. Most of the special exhibits do carry a fee. Burns Park is one of the largest parks in the country with 1,575 acres. Burns Park features a log cabin which was built prior to the Civil War, a covered bridge, a fishing pier, camping areas, a 36 hole golf course, baseball, softball, tennis, hiking trails, an amusement park and more. Located at exit 150 off Interstate 40. Most of the park is free (some small fees for some attractions). Other parks to visit include Riverfront Park, with the super fun Peabody Park, Murry Park, and War Memorial Park. You can also check out the Arkansas River Trail which connects many parks in a 14-mile loop. The Old State House is the oldest standing state capitol building west of the Mississippi River. You can tour it for free and see some historical artifacts. Located at 300 W. Markham in Little Rock. If you're into the military or history, The MacArthur Museum of Arkansas Military History is the perfect spot. It's located at 503 E. Ninth St., in MacArthur Park and it has everything from Civil War artifacts to artifacts from today. The National Historic Landmark that the museum is located in was actually the birthplace of General MacArthur and was once used as an arsenal! This is one of the only state capitols that was modeled after the capitol in Washington DC and has served as the "body double" for the nation's capital in many movies. You can have a guided tour or just walk through yourself. The free scheduled tours of the Capitol Building are offered weekdays between 9 am and 4 pm. Call 501-682-5080 for more information or to arrange a private tour. While the vendors would probably prefer if you shopped, you'll enjoy just browsing the River Market. Along the streets of downtown Little Rock there are lots of interesting shops and restaurants and during the Spring & Summer the Farmer's Market is open and it's great fun! The River Market shops are open year round, the Farmer's Market is open Tuesdays and Saturdays from late May through October. The Central High Museum and is located at 2125 Daisy L. Gatson Bates Dr. in Little Rock. It was the location of the infamous desegregation in 1957. The museum is a restored gas station across from the school and it chronicles the story as well as some other Arkansas history. The museum is open Monday through Saturday and Sunday. Little Rock is a great place to track the former President. From the Governor's mansion where Bill Clinton once lived to the old Gazette building where he headed his campaign, the downtown area is full of Clinton sites! Right outside of Little Rock in Roland is a great place for a family picnic and nature walk. Pinnacle is a day-use park with a few hiking trails, areas for camping and fishing and a great visitor's center. You can even participate in most of the park's special events for free, though for things like lake cruises, there's a fee. Take Exit #9 off I-430 at Little Rock and travel seven miles west on Ark. 10, then go two miles north on Ark. Located in Lonoke, it's not too far from Arkansas and is a fun place to visit for kids. This state-owned hatchery raises most of the fish that are used to stock Arkansas rivers and lakes and is one of the nation's largest warm-water fish hatcheries. It's also a great place to watch wildlife, specifically waterfowl. They have a great visitor's center with lots of information about aquaculture that is Located on 23 Joe Hogan Lane in Lonoke. 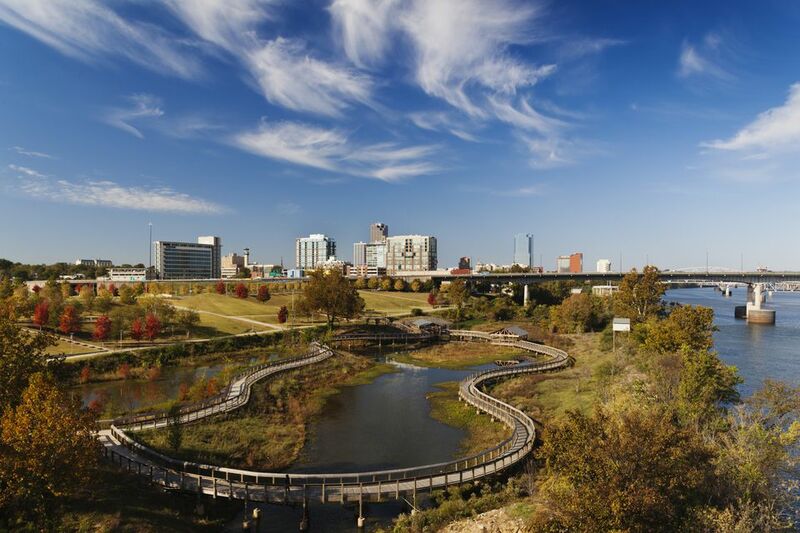 One of the greenest buildings in the nation is located in Little Rock and you can take a tour. Find out what makes Heifer International Headquarters so green and just want it means to be "green." Tours are offered Monday through Friday. It is located at 1 World Avenue.